Hello Ribbon Retreat readers, this is Anshu from Blooms And Bugs. I’m back with another free sewing pattern for a toddler’s dress. I saw a similar dress at Gap and I immediately asked Michelle if Ribbon Retreat would be interested in having me do a tutorial for this dress. She said yes! and I got to work…I finally got it right just in time. I like how it turned out and I love this beautiful print. I hope you like it too and enjoy making some of these for your little girl. Pattern: Download the Collar Dress Free Pattern in size 3t. Print on an 8.5 X 11 inch paper with margins set to 0. The pattern is 4 pages long. 1. Cut the pattern pieces. Cut a five inch long slit at the center of neckline in the back piece. 3. Cut out a rectangle piece of fabric 7 inch long x 3 inches wide. Place it beneath the slit (right sides together) and sew along the slit with a quarter inch seam allowance. 4. Now cut a slit in this rectangle, overlapping the existing slit. 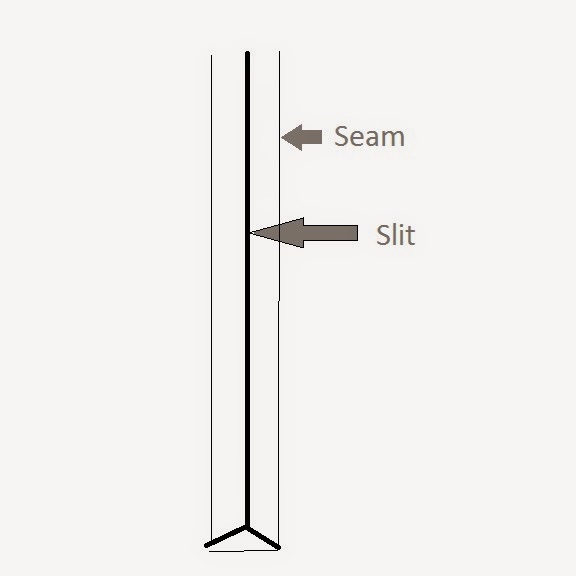 1 cm before the end of the slit, cut a fork (like an inverted Y) extending all the way to the corners but not cutting into the seam. 5. Turn the rectangle inside the slit and press. Fold the rectangle fabric’s raw edges inside and press those too, you could finish them now or later after joining the collar. 6. Sew both collar pieces on three sides (right sides together). To turn out snip the corners and cut notches along the edge. Seam allowance – 3/8 inch. 7. Turn out. With a pointed object (e.g. a pencil) poke the corners out. Press. 8. Fold the raw edges about 3/8 inch inside and press. 9. Pin the collar along the neckline sandwiching neckline between both layers of the collar. 10 . Sew along the pins. 11. Finish the back slit by sewing around the edges. 12. Take a 2 inch long scrap of ribbon and make a loop. 13. Sew the loop and button at the back, just below the collar. 14. To finish the sides and armholes – Sew 5 inches below the shoulders with a 1/2 inch seam allowance. Cut a horizontal slit in the seam allowance at 5 inches and fold the armholes twice with quarter inch seam allowance. Press to keep it in place. Sew along the armhole. 15. Finish the hemline by sewing a ric-rac on it. And what do you know – The collar dress is all done! It is very easy to grade the pattern down to smaller size. 1. Raise the front neckline a bit and also widen it. Since this is a collared dress we want the neck line a bit higher and wider. Basically something similar to a boat neck. although thats not really needed. a semblance of short sleeves without having to finish the traditional armholes. Although if you like the classic look of rounded armholes…by all means, go for it. I highly recommend doing a test run ( aka sewing muslin) to test the fit. I usually sew a quick one without finishing any seams or hems with some older/unusable fabric of the same weight. It takes half an hour including drafting and sewing but gives me much better idea of the final outcome, before I cut into pricey fabrics. If you like to buy cute kids clothing I also have a small etsy store called Blooms And Bugs which is currently stocked with pretty tutu dresses and pettiskirts for your fashionista. Do drop by. Anshu is a wonderful Contributor. She has also shared, with us, her adorable Reversible Baby Dress Tutorial. Anshu is very talented and would love for you to visit her at Blooms And Bugs to see all of her fun creations. With summer just around the corner, what is your “must have” summer accessory or wardrobe item? Sunscreen, sun glasses, flip flops, red polka dot bikini? Hehe! Whatever it may be…Happy Summer & Happy Creating! This is very cute. How hard would it be for me to cut it down to a 1T do you think? My grand daughter is only 8 months but this would be so cute on her if I could figure out a smaller size. something similar to a boat neck. I hope you sew a beautiful dress for your granddaughter. Good luck! I’ve been looking for a pattern like this in adult sizes. Any ideas? Thank you!